Offering you a complete choice of products which include Normal Resistive Discharger, Charger with Re-generative Discharger and Constant Current Discharger. 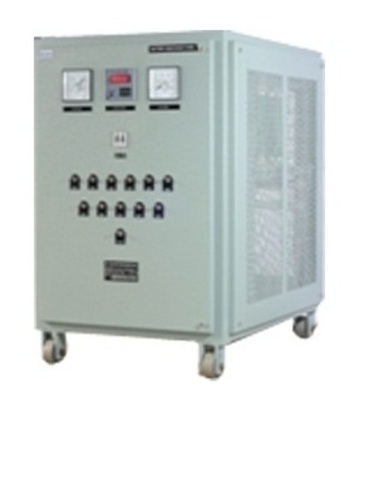 The battery discharge resistor panel is a mobile unit and is used to carry out capacity test of the battery bank during initial charging and also for periodic maintenance. The discharge bank eliminates the need for water load bank which requires continuous monitoring. Chloride normal resistive discharger consists of resistance, switch and fuse. Current adjustment is possible through switching in/out of resistances in the circuit. Total discharge ampere-hour can be measured through Ah meter. Standby Batteries require periodic discharge to ascertain overall health and available capacity. It is generally done through resistive discharging method which causes huge power loss and heat generation. In the resistance discharging method, the value of resistance also needs to be changed continuously to maintain constant discharge current manually. This method can not truly be called constant current discharge as the current is maintained in particular band depending upon operator’s skill and alertness. It requires continuous intervention of a skilled technician to monitor current and discharge resistance continuously to maintain the current in required band. Regenerative discharging system has the facility to discharge the Battery at a precisely constant current rate and does not require attention of an operator. Once the discharge current is set by a potentiometer, it will be held constant in spite of battery voltage variation, through the incorporation of close loop current control method.Constant current regenerative discharger is the part of battery charger and as such it has also facilities to supply the continuous dc load and simultaneously charging of battery bank. This is a specially designed Portable Discharger with a unique discharging logic to discharge a 12V battery. This discharger uses constant current (CC) mode of discharging and stops automatically, which avoids deep discharging. All these features ensure unattended and safe discharging of a lead acid battery at any point of time and at any place. This is most suitable for discharging a charged battery at customer premises and can also be used at service station. This is a ‘must have equipment’ for the dealers of inverter and automotive battery.. This discharger displays all the technical parameters like Battery Voltage, Discharging Current, Total Ah output and Discharging Time in the display panel and helps the users’ service engineers to know the state of discharge of the battery at a glance.